I read two books I loved recently. One was a reread. It is Mrs. Miniver by Jan Struther. My local library has a bad habit of getting rid of older books so periodically I check out ones I particularly like in the hopes of preventing their culling. 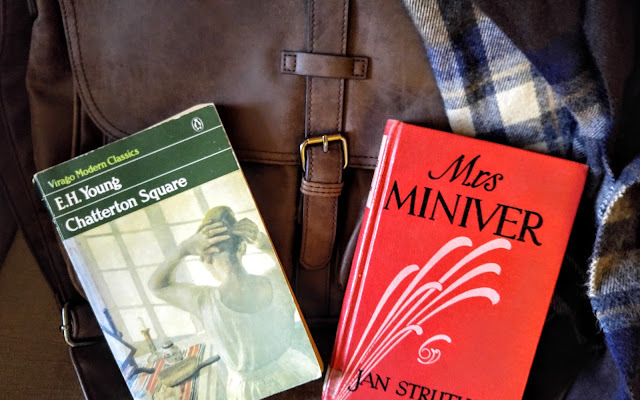 The last time I read Mrs. Miniver was before I started blogging so it was definitely time to check it out again. I was tempted to check out Dickens entire ouevre in order to protect them as well. They looked like they hadn't moved from the shelves in years. However, I thought the librarians might have some questions if I staggered up to the desk under a tower of Dickens novels. Maybe I will work my way through his novels one at a time. Why do libraries get rid of old books? I know they have to stay current but there is a real value to older books as well. The library recently took all their Georgette Heyer novels off the shelves. What were they thinking? Probably that no one reads old books, but I do and I miss being able to go into the library and find what I want. Anyway, back to Mrs. Miniver before this turns into a rant. I am sure most are familiar with this book, especially since it was made into a movie during WWII. The book is a series of charming vignettes about Mrs. Miniver and her family. They live a privileged life in London just before the start of WWII. The vignettes were originally written as a series of newspaper columns for The Times. They are all about small aspects of life; Christmas shopping, a dinner party, getting a new car, a country house visit. Mr.s Miniver does seem to have a way of saying things I didn't know I was thinking. I ended up with a book littered with sticky notes. I won't inflict all of them on you but here are a few of the quotes I marked. Tea was already laid: there were honey sandwiches, brandy-snaps, and small ratafia biscuits; and there would, she knew, be crumpets. Three new library books lay virginally on the fender-stool, their bright paper wrappers unsullied by subscriber's hand. The clock on the mantelpiece chimed, very softly and precisely, five times. A tug hooted from the river. A sudden breeze brought the sharp tang of a bonfire in at the window. The jigsaw was almost complete, but there was still one piece missing. And then, from the other end of the square, came the familiar sound of the Wednesday barrel-organ, playing with a hundred apocryphal trills and arpeggios, the "Blue Danube" waltz. And Mrs. Miniver, with a little sigh of contentment, rang for tea. Don't you just want to be in that room and settle down for tea with Mrs. Miniver? Maybe pick up one of the library books to see what she is reading. And nibble on a ratafia biscuit because I always read about them in books and have no idea what they taste like. I also liked this quote about marriage. It seemed to her sometimes that the most important thing about marriage was not a home or children or a remedy against sin, but simply there being always an eye to catch. And this made me chuckle. "Ha!" said the Colonel. She noted with delight that he really did say "Ha!" This made a valuable addition to her collection. She had lately acquired a "Humph!" and two "Whews!" but she was still waiting in vain for a "Pshaw!" If you haven't read Mrs. Miniver, do so. She manages to catch everyday moments and thoughts and make them special. The picture of life is of a time that doesn't seem to exist anymore but every time I read a book like this I yearn to step into the pages and wander the English countryside. The second book I read is Chatterton Square by E. H. Young. I love Young's novels and have been rationing them because I don't want to run out. This book is set just before the start of WWII during the appeasement era. It is the story of two families living across from each other. One woman is married to a priggish man she does not like or respect and the other's husband has left her and moved to France. This is a quiet book with great emotional depth. It is not full of huge events but instead it contains the gradual development of characters and relationships. Not everyone is likeable, many make mistakes, but Young does a wonderful job of making all of them believable and sympathetic. I particularly enjoyed one character's description of why she valued books and reading. I've made hundreds of friends, yes hundreds of them, good and bad and all interesting. They can't possibly die before I do. I'm sure of them for as long as I want them and when. There's somebody for every mood and though they don't go off in tempers.' she said, giving Rosamund one of her meaning looks, 'and leave you in the lurch, you can send them away when you've had enough of them. And this about the changing role of parents. When they were babies she had looked forward to the time when they would not need constant care and now she found that keeping them out of the fire, from falling downstairs and eating unsuitable substances was nothing to the inaction she had imposed on herself, the advice she must not offer, the knowledge that they would never consider themselves in need of. Mrs. Miniver was a light and charming book despite the looming spectre of war. Chatterton Square is a darker, more introspective book. I loved both of them and highly recommend them. Thanks for commenting. Mrs Miniver is a wonderful book. I hope you enjoy your reread. I've never read either of these, but I'll be on the lookout for them! I think you would enjoy them both.